In this post I will outline the steps taken during the attack demoed in the practical part of the webinar. If you have any question, please post it in a comment. Here is the network diagram. The blog was vulnerable to a stored XSS attack, so I put my BeEF-XSS hooking payload there. An user from the internal network opened the company blog and the browser session got hooked by BeEF. Using the Host/Get System Info command I discovered that the Windows7 machine was running a little outdated java version. I used exploit/multi/browser/java_jre17_provider_skeleton in Metasploit to create a webserver with a malicious Java applet. I sent the applet to the hooked browser using BeEF’s Misc/Create Invisible Iframe command. I got a meterpreter shell on the internal machine as a standard domain user. I performed some information gathering about the network configuration and the Active Directory domain. Then I started a cmd shell, to gain access to the AD policies files via the special SysVol share on the domain controller. Exploiting the default permissions on AD policies I got access to the username and the encrypted password of a local administrator. The password is strongly encrypted via AES-256-CBC but security researchers got to know the encryption key, so I just decrypted it by using the gpp-decrypt tool. I started the pivoting phase by routing the traffic from my local machine, through the meterpreter session to the internal network and I collected information using post/windows/gather/enum_computers and auxiliary/scanner/smb/smb_version in Metasploit. I used exploit/windows/smb/psexec module to get a shell on a Windows XP machine. I did this to just gain some time by exploiting older and weaker ciphers and methods. The same attack techniques work on Windows 7 and 8. I got access to the cached domain credentials on the machine by using post/windows/gather/cachedump. This is were most of the demos out there would have stopped. You have some cached domain credentials and you can crack them with a dictionary. The (simulated) users asked an administrator for help, and the sysadmin opened a remote connection on the client machine. I stole the authentication token of the sysadmin’s process and run a cmd shell. I performed a halflmchallenge authentication versus a SMB server I created by using Metasploit’s auxiliary/server/capture/smb. Then I cracked the challenge response, using rainbow tables and obtaining the password. Opening a port forward through meterpreter from my local machine to the domain controller. And finally opened an RDP connection! In the next few days our students will get this scenario in Hera Lab for free, with a detailed PDF with instructions and solutions to perform the attack. The students will also gain instructions on how to perform the attack exploiting only the Windows 7 machine and without cracking any password! September 17, 2014 update: All Penetration Testing Professional students now have access to the lab scenario “From XSS to Domain Admin”. You can visit your Members Area and check under “My labs>Hera” to start the lab. Active Directory policies are a great tool for systems administrators. They can use them to deploy systems and users preferences, lock down the workstation, secure systems, create users and much more. By default active directory policies have read permissions granted to the domain users. 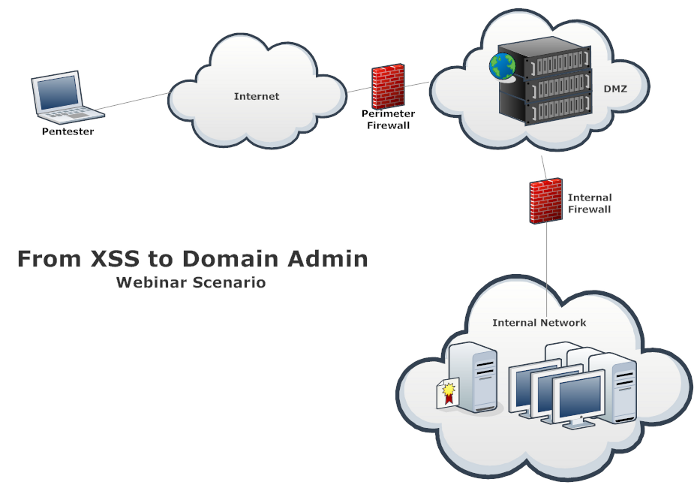 In this webinar we saw how an attacker can exploit a policy file to get access to a local administrator account‘s credentials and then perform an escalation to a full domain administrator account. Keep up the good work Gira! Is this a static key which is the same for all windows systems, or is the key specific for this szeario? If it is specific, where could the security researchers found the key? I was wrong, security researchers didn’t find the the key… It’s public! You can find it on MSDN. the means is you can According to the algorithm fuzzing the password? you do not need to crack the password. You just have to decrypt it.